It is the World Health Organization (WHO) International lead poisoning prevention week of action between 21-27 October 2018. Read more about the WHO campaign here. Get involved with WHO on Social Media! You can also create your own posts on Social Media. 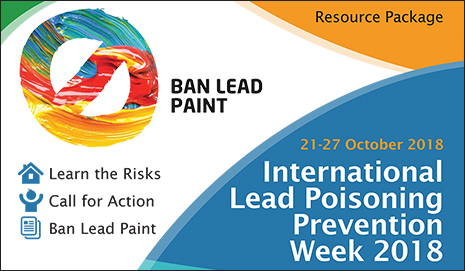 For the international campaign addressing lead in paint, use the hashtag #BanLeadPaint. For the broader lead campaign, including local, domestic and international programs, follow #ILPPW2018. If you are using Twitter, tag @UNEnvironment, @WHO, @EPA, @EPAallnations and @ToxicsFree to join in the conversation.